Ballybunion Golf Club is 125 years old this year. It was first established in 1893 but it quickly ran in to financial difficulty before it was rescued by a Colonel Bartholomew in 1906. Since then the club has grown in size and reputation and in 1984 a second course, The Cashen Course was opened. 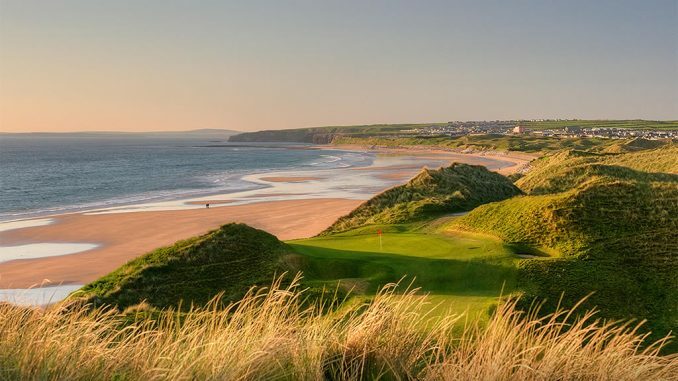 Many of the world’s top golfers regard Ballybunion as one of the best links courses in the world and it was Tom Watson who visited Ballybunion in 1981 who oversaw the redesign of Ballybunion course to make it the internationally recognized course that it is today. Membership at Ballybunion Golf Club is highly desirable and in great demand and for most of the year tee times are fully booked out well in advance. Quite a few prestigious tournaments are held there regularly, most notably the Murphy’s Irish Open in 2000 which was won by Swedish golfer Patrik Sjöland. Many top golfers and celebrities have played at Ballybunion. They include Jack Nicklaus, Tom Watson, Tiger Woods, Phil Mickleson, Lee Trevino, Sam Torrance, Sergio Garcia and US President Bill Clinton who played there a few times. The Old Course is 6,802 yards long an is Par: 71 Men / 74 Ladies. The Cashen Course is 6,306 yards long and is Par: 72.